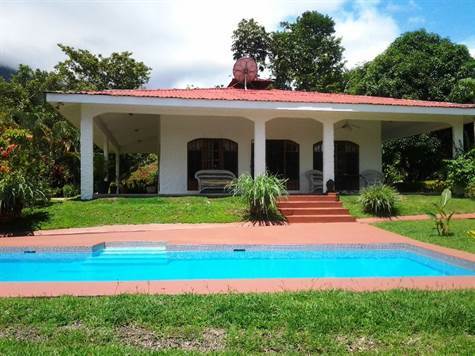 This lovely home near Ojochal and Tres Rios is your private retreat with easy access to the many pristine beaches, fabulous world class restaurants of Ojochal, and golf at the San Buenas Golf Resort. Perched on a small knoll you'll enjoy the big mountain views, tropical landscaping and breezes from the covered terraces; just a few steps from the pool and the perfect location to enjoy your morning coffee or a tropical drink. The home is all on one level and features an open living room/kitchen with a center preparation island and tall ceilings. The master bedroom has direct access to the terrace and tropical woods were used in the en-suite bath and closet. There is plenty of room for family or friends with proximity to the area’s great activities. This home is priced to sell. Contact me today to schedule a showing of this charming home!